As usual, she brought her fun times and rockem-sockem self out of the studio, and unleashed it upon the outdoors! She was awesome, she was fantastic, she was any other number of similar words to describe great – to work with. We thank her for waiting for this perfect day, thank her for not being afraid of the train (like Matt was) and wish to offer just a smidgen (not quite sure if that is a word) of our work together – Enjoy! OH MY LITTLE SUGA… You are so BEAUTIFUL!!! 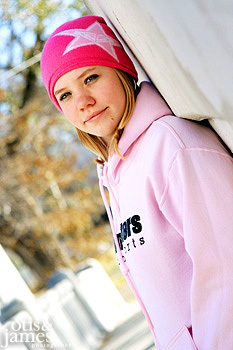 It is so hard to believe that you are already old enough to be taking senior photos (talk about making me feel OLD). It seems like just yesterday my “Lil’ Ande Pandy” was running around on the beach in Florida wearing nothing but a diaper (HEE HEE)!!! these pictures are FABULOUS!!! I am so very impressed with Otis and James. Makes me want to have my senior pictures done again (50 million years later…HA).